In February, I made a clean beauty switch and swapped all of my beauty and skincare products for clean brands. Our skin is our largest organ and just the thought of absorbing so many chemicals on a daily basis through everyday products just didn’t make sense. Since making the switch and after two months of testing out a variety of products, I’ve compiled a list of my favorite clean beauty and skincare products. There are still more products to add to this list, but this has you covered. I’m challenging you to ditch your current beauty and skincare products for those that are clean, organic, and effective! One Love Organics Skin Dew. I can’t get over how much I love this moisturizer. It locks in moisture and it’s lightweight enough for me to use day and night. Juice Beauty Eye Cream. I need all the help I can get with my eyes! This rejuvenates my eyes and I use it day and night. One Love Organics Foaming Cleanser. This cleanser takes off all of my makeup without stripping my skin of moisture. Eminence Hydrating Mist. I don’t like using typical toners as they are super drying. This one helps lock in moisture (yes, everything I use adds moisture! ), plus it helps prevent wrinkles. One Love Organics Vitamin C. I use this Vitamin C serum every over night. It brightens my skin. I add an extra pump on nights that I go to bed late which helps me look more refreshed in the morning. Indie Lee Squalane Facial Oil. My skin is dry in some places and oily in others. This facial oil balances everything out! Goop Exfoliating Instant Facial. This exfoliant is really a mini facial. I use it twice a week for glowing and smooth skin. Beauty Counter’s Flawless in Five. If you’re looking to make a quick and easy switch, Beauty Counter has you covered. Their Flawless in Five collection gives you the beauty essentials you need. 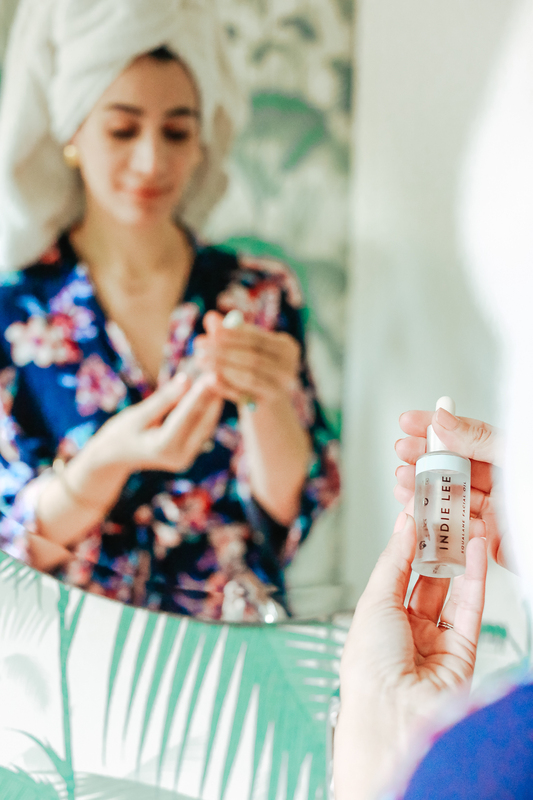 W3LL PEOPLE Bio Tint Moisturizer. I’m not a foundation girl, so I love this tinted moisturizer with a solid SPF. This tinted moisturizer leaves my skin dewey and soft and offers plenty of coverage. Beauty Counter Concealer. I’ve tried so many concealer pens and none of them conceal like this one! This one does the job and doesn’t require a lot of product either. W3LL PEOPLE Bio Bronzer. This. Bronzer. Is. So. Good. Just a couple of dabs and I have that amaze summer glow! W3LL PEOPLE Mascara. Simply, this mascara works. It elongates and thickens my lashes, plus it comes in various colors so I can opt for blue lashes in the summertime. W3LL PEOPLE Liquid Liner. I’ve been wearing liquid liner since I was 18 and this is the one clean brand that lasts. Kjaer Weis Blush. This compact is simply beautiful, but the blush is even better. A little bit goes a long way so although it’s on the pricier side, it will last a long time. Kosas and Axiology Lipstick. Both brands have highly pigmented lipsticks which you know I love, but their staying is what has me obsessed. They both stay on longer than any other lipstick brand I’ve tried! Love hearing about your favs! I’ve personally been a die hard fan of Drunk Elephant! This is such a great round up! 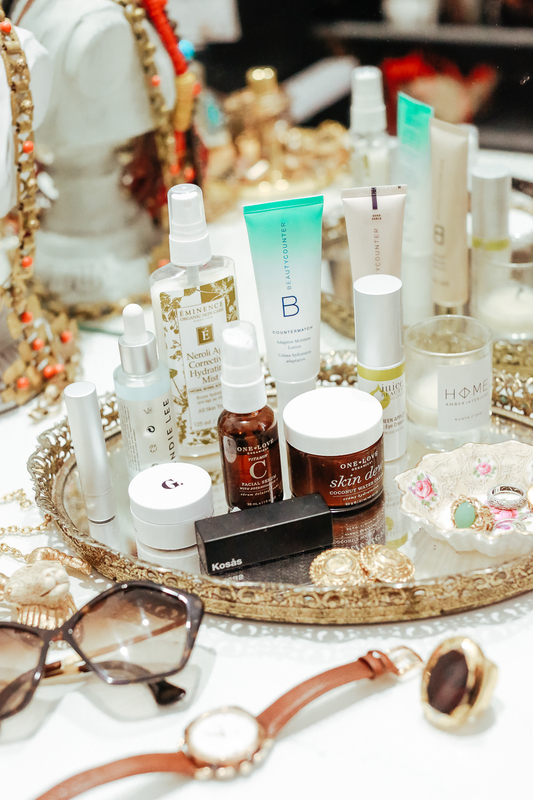 All of those skincare products sound fabulous! I’ve been looking for a few new products to change up my Spring skincare routine. I need to check out that vitamin C serum, I’m almost done with my current one. I’ve been wanting to try the Goop instant facial after hearing so many good things about it! Thanks for sharing your faves! These sound amazing, I need to try that mascara! I am loving these picks!! I need to add a few of them to my cart right now! Ooh, this skin dew moisturizer sounds amazing! Will definitely have to check these out! Beauty Counter is my absolute favorite brand!!! Sp many great picks! I definitely need to try these out! I love everything that I’ve used from beauty counter!